Everyone has a story. As most do, Tha Dah’s story begins with her mother who was living in Burma (also known as Myanmar). Tired of the constant attacks on her village Tha Dah’s mother was forced to relocate and eventually joined the Karen National Union (KNU). During that time she met Tha Dah’s father, a well-known KNU member who for similar reasons had also escaped his village. Tha Dah was born in the jungle near the border of Thailand and Burma. Tha Dah lived with her mother, three older sisters and her brother. “My father helped build the house before he left. After some time, the house became unstable. My brother was too young to help, so my sisters would have to go to the mountains and cut down the bamboo to repair the house.” Since her father would come home every four to five months her mother was their biggest source of income, making clothes and selling what she could. At the camp, she completed second grade, mostly learning the Karen alphabet. The schooling depended on passing an exam. If you didn’t pass you could be 14 years old and still be in second grade. Something that is very common, according to Tha Dah. Her father eventually hired someone to smuggle them out of the camp and bring them to Bangkok. There they applied for refugee status and after a year, they came straight to Minnesota. At that time Tha Dah was 10 years old. They struggled to adapt. “There weren’t many Karen families, at most 10 to 20. No one knew who the Karen were.” Social service providers unfamiliar with the population and often times confused the language with Korean or the name Karen. It is pronounced kah-REN. “I struggled in school.” Her parents, a constant motivation, kindly reminded her of why she was here. They came to the US looking for a safer, better future. They encouraged her to do well in school and she forced herself out of her comfort zone and learned English. During her junior year at St. Catherine University, her advisor sent her a part-time community health worker job listing at WellShare International. The moment she saw it, she knew it was exactly what she wanted to do. Although she has never smoked, she understands the struggle and remembers seeing many people, including children, chewing and smoking tobacco at the refugee camp. Currently she’s working on The Karen Tobacco-Free Program, a partnership between KOM (Karen Organization of Minnesota) and WellShare International, which educates the Karen community on the harms of tobacco use. She is also a certified Tai Ji Quan teacher and offers balance training activity for older adults. We continued our talk about the hardship of becoming a US citizen, safety and security: The struggle of finding jobs when you don’t speak the language. Health disparities among refugees and immigrants. Why Karen and members of the other ethnic minority groups resent being called Burmese. 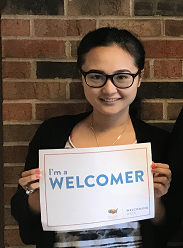 She acknowledges that although she does not feel fully welcomed here the opportunities she’s had would be impossible in the camp. “Explore and embrace the challenges,” said Tha Dah. Through every challenge strength forms. She couldn’t be more right.